My question for you this morning is, after taking your course, is the goal that I understand that I need to make changes alone, or will I know what changes to make and how to make them? For example, regarding the business model innovation module, is it fair to assume that after finishing that module I may come to the conclusion that my business model needs revamping or a total redo? If so, what then? Does the course provide information regarding a suggested business model(s) and how to implement it or, given the relatively reasonable time and cost commitment, do I then seek other sources for this kind of information? You Ask: Is the goal to understand change is needed or to know what and how to make the change? By the very nature of having attended UnleashWD and your question(s), I know you know change is needed. So no, that is not the goal of the course. Those who commit to Innovation Inspired know change is needed. They are frustrated and quite possibly frightened about their future due to the lack of change … that they know in both heart and mind that they must get better faster. My research shows that most distributors suffer from inherent inertia, defined as: the lack of movement or change, especially when movement or change is needed. Innovation Inspired was created to … with the goal of (to answer your question directly) helping you obliterate inherent inertia. For change to happen the leader must be surrounded by those with the same world view as he. This team, might be a spouse of a small “mom and pop” distributor or the thirty regional managers of a Fortune 500 Distributor. Size of the business is not the issue – having a core group of individuals who see the need for change is critical. Innovation Inspired is designed to make this happen. So that a “mom and pop” distributor can get his spouse and driver around a laptop while eating a sandwich, and have deeper conversations about what needs to happen than ever before. Alignment is not enough. There must be commitment. A commitment that says … we will work through the unknowns, the obstacles, challenges, and even the constraints of resources. There must be a commitment to do the hard work of creating something new. Innovation Inspired creates this commitment through the cadence of collaboration that is baked into its design. The very act of scheduling the 15 minutes at a time to progress through Innovation Inspired, creates both an organizational and personal commitment from yourself and those you pull into the process. I define innovation as … Leading customers to a better future for which they are willing and capable of rewarding you. But this very definition … if we are going to lead our customers … it suggests we must do something different than we are today. We must create something new that prior to today did not exist. We need inspired ideas. 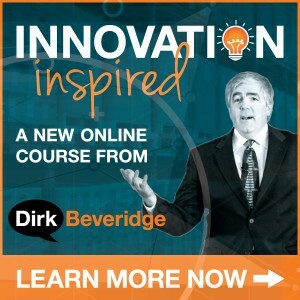 Innovation Inspired is a self contained idea generator. The information I share, the case studies provided, the research referenced, and of course … the bonus UnleashWD presentations from five brilliant change agents and innovators (in context to the course content) is nothing short of an idea generator on steroids. Of course if 100 people watch one Innovation Inspired video there could be 100 … no … 1,000 brilliant ideas … because every business and every individual is … well… individual. Make no mistake you can do this. Often the first obstacle that must be overcome is in taking the very first step. That’s understandable … because there is absolutely no roadmap from Harvard Business School, Stanford, or even my alma mater Western Illinois University (For sure not out of Western!) that fits very business. I guess that’s what leaders do … they dig deep to find the courage to move forward in the very face of the unknown. Innovation Inspired provides you the courage to take the first step. And that will then lead to the next step … often not the step you had envisioned up front. Dots begin to connect which leads to courage to TRY SOMETHING. Map out a new business model possibly. And then run that prototype past five of your customers (*note that specific “how” is not specified in Innovation Inspired … but these are the types of “how” that surface when you commit to Innovation Inspired). You Ask: What happens when after the module I conclude I need to revamp (for example) my business model – are there suggested business models and reasonable time and cost commitments? Throughout Innovation Inspired, there are case studies, examples, and research that is designed to get you to move. To act. To change. And … to innovate. Using the analogy above, how a “mom and pop” distributor innovates their business model will be different than how a Fortune 500 distributor does. And that will be different than how a mid market regional distributor attacks the opportunity. So absolutely we share example visions, cultures, value propositions, business models, and transformative leadership in action. 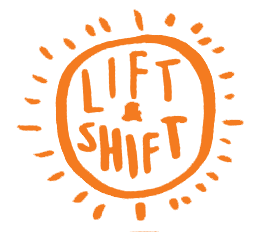 I am committed – 100% committed – I’m “all in” committed to helping you innovate … revamp whatever it is you (and your aligned, committed, inspired, and courageous team [of 1 or 30]) prioritize as a result of committing to Innovation Inspired. The innovative and proprietary Biggest, Baddest, Boldest, Lift and Shift™ process … will give you the STEP BY STEP “HOW” to make your priority happen. But I do guarantee that you will be led to rethinking your business in completely new ways, and that you will in the end have an in-depth plan to move forward. But again, you must commit to Innovation Inspired. After all, inherent inertia is your enemy. And Innovation Inspired is yours to … once and for all … attack this soul sucking inertia with everything you’ve got. And, I’ll be right there with you every step of the way. PS: As I’m about to hit send, I am also reminded of the amazing potential Innovation Inspired has. That until now there has been absolutely nothing … nothing to help distributors like you make massive moves to create their relevant, sustainable, and profitable future. Peter the very fact that we are communicating tells me that you know beyond a shadow of a doubt … what made us relevant in the past does not guarantee our relevancy going forward. That what made us sustainable and profitable in the past does not guarantee our sustainability and profitability going forward. Explore new partnerships and strategic alliances to introduce virtual reality into their sales and service model. This by a mid-market building materials distributor. A small “mom and pop” beauty supplies distributor map out a completely new business model that introduced game changing services and products to their market. And a larger plumbing distributor approaching a manufacturer to re-define their partnership model and to innovate new services for their mutual customer – service plumbers. But of course in all these cases … Innovation Inspired is the catalyst. And I’m honored that Innovation Inspired could become a major part of the story you tell your grandchildren when you describe how you built what you know in your heart is waiting to be built.